I think I’ve finally decided how many parts that I am going to do of Andie Mitchell’s cookbook, Eating in the Middle. 7. This is a very easy and delicious salad that you can make in no time. Especially good for when you're a very busy person, but don't want to sacrifice food. Jerk shrimp is sweet and a little spicy. I’m usually scared of odd numbers, but the number 7 seems so satisfying for this one! So that means that there will be 4 more amazing recipes by this amazing cook after this one! That’s super exciting to me! I wasn’t sure how I would feel about this recipe, it’s a jerk shrimp salad with mango, avocado, and an apricot dressing. The best part of this meal is that it took me about 15 minutes to make. Tuesday was an especially bad day, I had 3 deliveries for food/groceries/home stuff. Braedon was being an absolute nightmare, I’m guessing it was growing day. And Amazon was very late with my order. I had to get this meal out in like 25 minutes before Braedon went to bed. In a large bowl, whisk together the brown sugar, garlic powder, oregano, thyme, allspice, nutmeg, cinnamon, salt, and cayenne. Add the shrimp and toss to coat well. In a 12-inch nonstick skillet set over medium-high heat, heat 1 tablespoon of the oil. Add the shrimp and cook, undisturbed, until browned on one side, 2 to 3 minutes. Flip and cook until browned on teh other side and opaque throughout, about 2 more minutes. Transfer to plate. In a large bowl, whisk together the lime juice, apricot preserves, and the remaining 2 tablespoons of olive oil. Add the romaine, cilantro, carrots, and mango, and toss to coat. 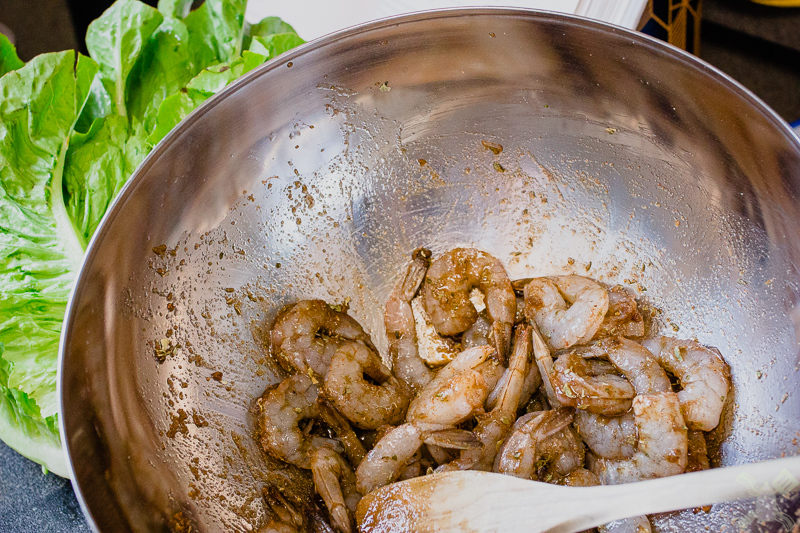 Divide the salad among 4 plates and top each with a quarter of the avocado and the shrimp. Also subscribe for more awesome posts!